On An Overgrown Path: Is classical music’s glass half empty or half full? Is classical music’s glass half empty or half full? Half full – Roberto Gerhard’s beautifully crafted and wonderfully bracing string quartets played by the incomparable Arditti Quartet have just been released on CD by French independent label æon – the lower case is theirs not mine. Gerhard was born in Catalonia in 1896, and the troubled recent history of that region divided its many great artists into those who like Pau Casals rejected Franco’s regime, and those like Xavier Montsalvatge who stayed to work under the Fascists. Roberto Gerhard, who studied with Schoenberg in Berlin and Vienna for four years in the 1920s, falls squarely into the former category: he publicly supported the Republican cause in the Spanish Civil War and when Barcelona fell to Franco’s forces settled in Cambridge where he lived and worked until his death in 1970. His two string quartets are late works - 1961 and 1950-55 – respectively and the new disc also contains his Chaconne for Solo Violin from 1959. Both the quartets show Schoenberg’s influence but also develop Gerhard’s belief that “the basic stuff of music is motion, not notes or sounds”. This new æon release is captured in positively visceral sound and comes with erudite sleeve notes by Malcolm MacDonald. The label is part of a group that includes Zig-Zag Territoires whose La Porte Félicité featured here recently. Other notable releases on æon include string quartets and trios from Jonathan Harvey – see New music in the paradise garden – Harrison Birtwistle and Edith Canat de Chizy, while a three CD survey of Brian Ferneyhough’s string quartets and trio is scheduled for future release. Spheres of influence seem to be shifting and æon has taken the high ground in contemporary chamber music leaving ECM to retreat to the less productive middle ground. But back to classical music’s big new ideas. New independent audience data from RAJAR shows that in Q4 2012 the BBC Radio 3 audience dropped year-on-year (Q4 2012 v Q4 2011) by 1.7% when measured by listeners and by 3.5% when measured by hours per listener. In the same period Classic FM increased its audience marginally, AOR network BBC Radio 2 increased listeners by 5.9%, while the total UK radio audience increased by 0.7%. Significantly BBC 6 Music, a station with a history of innovation that the BBC management wanted to close, increased by 31%. It is beyond doubt that BBC Radio 3 has implemented a dumbing-down strategy. It is also beyond doubt and proved repeatedly by independent statistical data that the station has failed to gain new listeners and that its audience trend often compares adversely with that of other networks. On the balance of probabilities there is a connection between the dumbing-down strategy and the station's poor ratings performance. So a strong case based on reliable data can be made that dumbing-down does not attract a new audience. And, more importantly, a strong case can be made that dumbing-down actually has a negative impact on total audience size. Now is anyone prepared to defend classical music’s big new ideas with some hard data? Half empty or half full? Also on Facebook and Twitter. 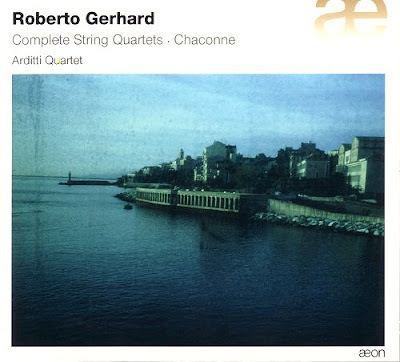 Roberto Gerhard's String Quartets on æon was bought at Prelude Records. Any copyrighted material on these pages is included as "fair use", for the purpose of study, review or critical analysis only, and will be removed at the request of copyright owner(s).